Seeing the Mona Lisa is not a quiet, contemplative experience. It is, indeed, a madhouse. The painting is located in the Louvre, in a room the size of an amphitheater. (If you haven’t been there, look at that first photo above. See that tiny, rectangular brown spec to the right of center – hanging on what looks to be the back wall? THAT is the Mona Lisa. The paintings to the left are NOT it. It’s also NOT on the back wall. It hangs on a panel in the center of a room). HORDES of people cram into that room to take pictures. Many look only at their camera, phone or iPad screens and never actually look at the painting itself. It is loud, chaotic, and stinks with the sweat of thousands of foreign tourists. Well, first, let’s suppose they DID do something to change it. What might that look like? Would we all buy a timed ticket to see her or perhaps stand in a six-hour long line, hoping to get in before the museum closes for the night? How many people should they let in at once? Ten? Twenty? Thirty, even? And how much time would you get to stand in front of her? If there’s a line behind you, I presume you’re on a strict a time limit. For those of you who have been to visit Leonardo’s Last Supper in Milan, you have a sense of what this scenario might be like. You have to purchase tickets (usually weeks) in advance and enter with a small group through a set of air-locked doors (the fresco is deteriorating; the church must protect it from the elements). Your time is limited. The painting is miraculous – and worth seeing – but the whole experience feels a bit… clinical. Is that what you want for Lisa? Would that really give you the intimacy you desire? Would she be as beloved if she weren’t… as beloved? Personally, I love seeing those masses of people desperate to spend a few moments with Lisa del Giocondo, a mother, a wife, an unknown Florentine. I have heard people ask what Leonardo da Vinci might say if he could see the spectacle, but I like to imagine what LISA might say… Just imagine what she sees when she looks out – day after day – on those crowds of admirers. Maybe that’s why she’s smiling – maybe she loves all of the attention. Or MAYBE that almost-smile is her laughing at us – just a little – for our absurdity. 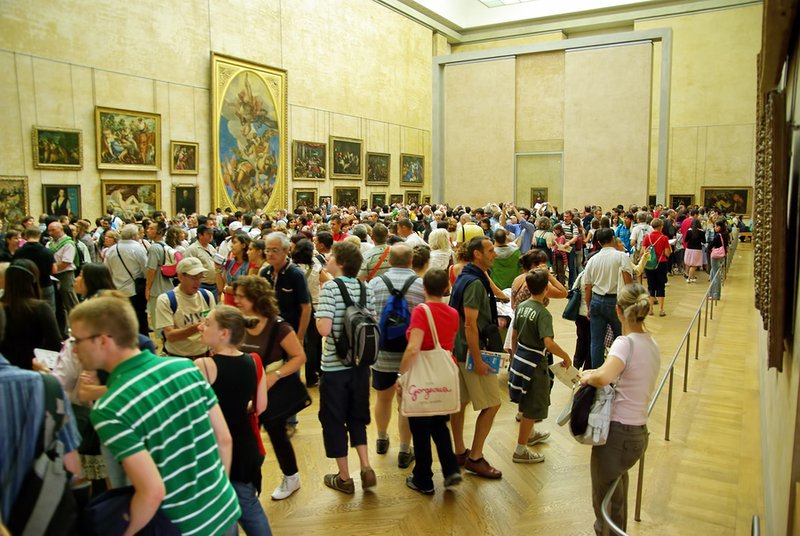 I’m sure the Louvre has the resources to implement some sort of “visiting system” to reduce the crowds. But do you want them to? I bet Mona Lisa would be in shock to see so many photos of herself online. Right Shane?! The thought of it makes me laugh. 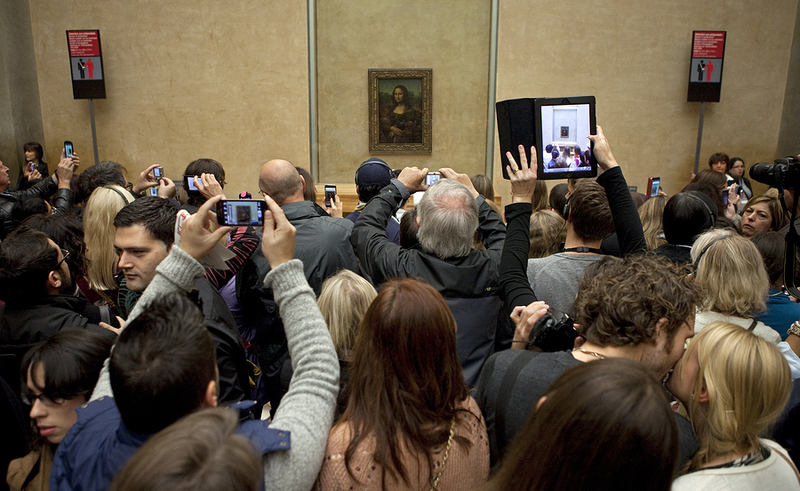 I had heard about this and was just as excited to see the hoards of people as the Mona Lisa. I had a little chuckle and took a picture of the people taking a picture. I’m glad I’m not the only one who gets a chuckle out of such things, sprinkleofhappy! art buchwald had a unforgetable artical in the old Harold Tribune on the 10 minute Louvre. starts with put on your running shoes. Venus di Milo was one of the stops. 10 Minute Louvre?! That’s impossible… and one of the most awesome things I’ve ever heard. I’m gonna have to look that one up! I have been twice among those crowds of so-called admirers and frankly, I did not feel they were admirers at all! Almost everyone was elbowing their way as near as possible to the painting, without regard to anyone else, snapping a picture or two without even looking at the lady herself then leaving for the next painting to shoot. You will have more intimacy admiring Mona Lisa on your computer screen than trying to get a glimpse of her in an overcrowded room!